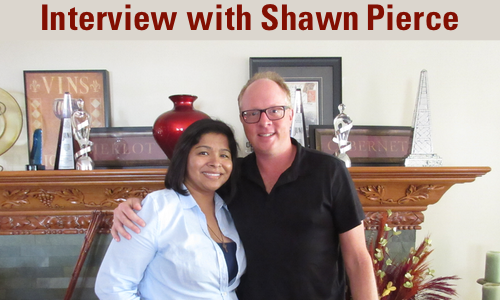 Here is how I felt when speaking with the man behind the music, the one and only Shawn Pierce! Shawn is on twitter (@shawnpiercetv) so make sure you follow him. Aimee J.: Hey guys! 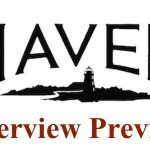 This is Aimee J. coming at you with an interview from Haven’s own, Shawn Pierce. 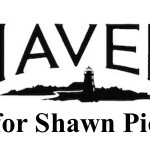 For those of you who don’t know, Shawn is the composer for the music on Haven and he was kind enough to speak with us about what he does on Haven and how it came about. So I, when we set this up, I went ahead and sent it to the Twitterverse and people were like: let me ask if they have any questions. Aimee J.: …To make it easier without messing it up for them. 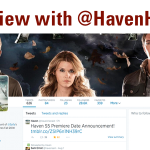 So, before we begin though, we were talking about it off record, but go ahead and explain how you got into Haven. Shawn: …might be 2000, might be 2001, might be 1999. I started out as the music editor and ended up becoming the composer, starting on Season 3 and I scored a whole bunch of episodes between Seasons 3 and 5. And I stayed on, uh, until that, well actually I stayed on in Canada until that two years ran out in Canada and then the last season was done down here, and I wasn’t involved in that. But from there I went on to Wildfire with the same group. Same family: Lloyd, Shawn…sadly Shawn’s father passed away who was a real force in television in the world and a real, a really wonderful bright guy and I learned a lot from him. And Shawn and I became friends. He was young and I was young and we were figuring this thing out together and…. Aimee J.: You’re both pretty young still. Shawn: Yeah, I guess, I don’t know. Aimee J.: [chuckles] I think it’s safe to say. They’re both pretty young. Shawn: Thanks for saying that—I don’t know if that’s true, but that’s…but thank you, Aimee, that’s lovely, yeah. Shawn’s young—Shawn’s younger than me. And we went into Wildfire and I was on Wildfire for three years. Aimee J.: You did Wildfire as a composer…. Shawn: As a composer, yeah. Aimee J.: So you kinda now transition from music editor to composer full-time? Is that what…? Shawn: It’s every field. So I did whatever I could do in the industry to stay working in the business, which was a lot of music editorial, um…. Aimee J.: Yeah, you’re list of music editing is long: twitches, um…so many things. Shawn: Yeah, lots of work for Disney, lots of work for MGM. That’s kind of where this, my company that I was partnered with, actually another composer in the family here, Pat Caird who was my composer friend and partner for a long time…he and I had a business that did professional music service for film and television in Vancouver because there was so much production happening around that time. Aimee J.: Still is, yeah. Shawn: …Then I stopped doing that. I just worked on anything I could do, anything in music that I could find. Aimee J.: So, one of the things I do, outside of the Haven website, is my own site; trying to encourage people to do their dreams and do the things they want to do. Would you recommend that someone jump in—like you did, you said that a lot of the experiences helped shape you and teach you the world—or would you keep focusing on trying to find that composer job? Shawn: Well, that’s a really tough question Aimee, because what’s changed over the years–technology, the information has changed a lot of things—it’s also removed a sort of unofficial apprenticeship system, where one could start in an earlier position, in a junior position, and work their way up. That used to be the way in recording studios. You’d start by changing ash trays and getting food and being a, what they called a “runner”, then you’d move up to assistant engineer, then you’d become an engineer through this apprenticeship system. That model I just described doesn’t really exist anymore because that studio model, as we know it, doesn’t really exist. So nowadays, with getting back on topic with film composition and working in the film and television industry, those roles, if you’re a composer a lot of times if you were just a composer you’d have a music editor, you’d have an engineer who’d mix your music or record your music for you, you’d have an arranger, a copyist, all of that…Those jobs have now sort of fallen under one umbrella, for usually one person. So I find myself a lot of times, except on Haven, where we do have a music editor in Toronto, he’s fantastic, Rob Bertola (sp? ), he’s great…but doing a lot of these jobs myself. So that’s, it’s discouraging to some, encouraging to others. And I’m one who, I’m on the encouragement side…. Shawn: …Of it. I like to do all these rolls, I spend a lot of time doing these rolls, I’m confident doing it myself. Now with technology, that’s made it even easier so that the younger generation that’s coming up doing these kind of jobs in the entertainment industry, they kinda learn it all. And there wasn’t tape machines and there wasn’t tape ops…Now there this: there’s programs that you do kinda everything in the box together. Aimee J.: And you just send it over the internet. Shawn: Yeah. That’s right. You just learn to do it all. So good and bad, I think it’s good. But what it’s…well, there’s the enabling—what it has enabled—but I think sometimes what gets forgotten if we go back to this resume and experience side, when you’re just doing it all, when you’re just jumping in, when you’re starting to write right away and working with picture and everything, you forget about the long lineage of etiquette and history and working in the business and seeing how it works. Because it’s…A lot of people who are in music think “well, I’d love to write music for television or for films”, but…It’s not about the music. And that’s hard for people to get their head around. It’s about the show. Right? Shawn: So it’s the television, and in our case what we’re talking about ‘cause I’m the TV guy, it’s about the television industry and it’s about the show; it’s not necessarily about the music. It is in some way, but it’s not, the music’s not featured. It has to support and be a voice. And for someone like myself that was an area and a role, I was always very comfortable in being part of something rather than stepping out and being a performer and being in front of people. I didn’t, well I spent a lot of time doing that, but I was never comfortable doing that. So I’m comfortable being part of a whole. Shawn: Rather than me just sticking out…So the music I write, if we relate that to Haven, sometimes it pokes it’s head out as a voice, which is fun, but a lot of times it’s just there as support which in most cases in this format, in writing music for television, that’s what it does. Shawn: That’s a really good question and it was so funny: I was just talking to some…Oh, my music editor out here on the bridge…he and I were talking about the first season of Haven and that pilot episode of Haven. If you watch that, it’s four years old now, that is sort of a hodge-podge of every style. We were trying to find out what was gonna work in the show. There was a lot of people involved—a lot of fantastic people involved—and they all kinda had their own ideas of what they wanted the show to be. And I tried to follow that, to connect those dots. They’d give me the dots and I was trying to…They want “let’s try some fiddle”, “let’s try eclectic instruments”, “let’s try maybe music of more first nations or Native American influence from the east coast of Maine”, “maybe a little bit more Mariner, coastal influence”, guitars and fiddles and that kind of thing. So we tried some of that stuff. The fiddle was a big part of the score in the first season. Shawn: And then Shawn was not a fan and he would just pull it out. So, a lot of times what I’ll do…well, I can jump ahead and say what we do now, but back then I delivered a lot of what we call stems to the mix. So everything’s split out. So if there’s a sound or an instrument that’s doing or much or not working or not hitting Shawn or Scott or Lloyd or whomever was on the stage, the recording stage at the time, they could just mute that. So, not getting too off topic, that was a very difficult but very fun process. Shawn: …because we don’t really know what the show is yet. Shawn: So we tried to figure stuff out. There’s some things that stayed throughout all four years and there’s some things that went by the wayside. The fiddle being one of them that kinda got tossed. Shawn: Ah, these are tough questions! Um, so there’s this concept of geek motif where let’s see if we can have unique themes that identify every character. So we started on the first episode with the Lucy Ripley theme. Lucy Ripley…was it, no, was it Lucy Ripley? What was the very first character? Aimee J.: That you see? Aimee J.: Well they talk about Lucy. Shawn: Yeah, I was just trying to think because there was the theme, there was a theme for Lucy…You know, we’re gonna, I’ll verify this by us going in and actually looking at some of the music. Shawn: Because this theme started and it was, it was in an attempt to try and have a sonic identifier, a musical, that one has a legit melody, that would identify the past and a certain point and time. Shawn: Trying to figure out the mystery of this woman’s past. Aimee J.: There is a scene between Nathan and Audrey and she’s talking to Nathan about her past, about Lucy, at the time we didn’t know who she was….and, is that the moment you’re thinking of? Shawn: ‘Cause it’s a great question…I wish I could just say “yes” that there is a Nathan and Audrey theme. And we tried to develop one in, when Nathan first figures out that he can feel her touch. So that’s the closest one we have, but what happened was, if you just keep playing their relationship then it just becomes about them and of course we know that’s, a big part of the show is about the two of them, but there’s always this history: Who is she? What is her past? What is her story? Aimee J.: Especially when they talk about the background. Shawn: Yeah, but when they’re together and when it’s an intimate moment or magic moment, yeah, when they’re talking about them…it’s there. What developed over the last couple seasons was this Haven piano theme that was just done in the pilot as a, as just this fun little thing turned into the end credits, by accident. Right? Aimee J.: It’s associated. It’s very….you hear it, you know what it’s…it’s identifying. Shawn: It’s just the piano piece. But that theme, now I adapt it as a Haven theme throughout. It’s always in different variations and…. Shawn: …different iterations throughout now. I’m going with a show theme identifier rather than individual character identifiers. Aimee J.: To cover other characters as well. Shawn: It started in the pilot when they showed up on their bicycle…That theme we still play for them all the time. So that stayed consistent. Duke’s thing…Kinda got away as he got less of a comedic character and more of a serious character, we got away. He has a theme for his, for the Red Eyes and his family curse. There’s a theme there that’s used every time. Aimee J.: …or moods or…. Shawn: Yup, there are. Especially so, like now we’re into William, like what I’m working on right now is: Audrey comes back in this new season as somebody else. Shawn: So without giving away too much information, she comes back as somebody else, so that somebody else who she is now, she needs a—she has a theme. Aimee J.: She has her own? Shawn: Yeah. She has her own thing. Shawn: …like you guys, I like to watch it as a fan. Shawn: So I don’t know from week to week, I watch the show, we spot the show: Shawn and I do and our music editor…and so I’m watching it fresh, so right out of the gate. Shawn: Another excellent question. Producers always are in charge. Shawn Pillar takes the lead, now, officially on the show for creative. Scott Shepherd was a big part of if starting in Seasons 1 through 3. Scott’s still involved, but Shawn now is taking the creative production role. He is in charge of it. So he…the process is: when they’re cutting the show, they will add what is called “temp music” (temporary music). They’re drawing that temporary music from the Haven library—the score library that I’ve created. Aimee J.: So past things that you’ve done? Aimee J.: That have been in an episode. Shawn: Right. So we have four years of that Haven score library that they draw from and they cut it into the show. Now, what we’re finding as we get later and later into these episodes, we found that last Season especially and starting here on Season 5, we’re finding this temp music (which is Haven’s score, as I’ve said) Shawn is liking that, because it’s all Haven music and he likes it a lot. So a lot of times the music that you’re gonna here, especially in this Season, was placed in ahead of time. And it’s Haven music and we just, we like it so much, Shawn liked it so much ‘cause he placed it in there, then we go “let’s at least use that theme” or “let’s use that vibe” or “let’s use that kind of sound” “do something that sounds like that” or “let’s just use it”. Shawn: Yeah. And that temp score, where it comes in, where it comes out, is a map. Then we use that map as the foundation for our spotting sessions—our music spotting sessions, where we find the spots where music is gonna come in and where it’s gonna go out. And during the time where it’s in: Is it happy? Is it sad? Is it funny? Is it scary? Are we starting a new theme? Because what…and just skipping back a little bit ‘cause this is important…when we get into the troubles, the, when we get into the specific troubles on episodes, that are…like we have the A-arc, the A story which is our whole Haven arc-like Season 4 was really the barn, and what’s going…or Season 3… Then there’s our A story. And then the B stories are these individual unique troubles in Haven. So what we’ll do a lot of times is we’ll come up with a theme for those individual troubles. Aimee J.: Season 1, yeah. Aimee J.: Kinda stayed with it. Shawn: Yeah. When they, like a…I’m just thinking of one from Season 4, a firefighter trouble. I don’t know why I just thought of that, because it had a unique theme played on a unique instrument for his trouble, this making people self-combust. Shawn: He had a theme. So, we try and come up with a sound for the unique, individual trouble for each episode and kinda play that and that kinda threads the story together for those specific troubles. Shawn: That’s Shawn, yep. Shawn usually decides where…when and where he wants a song. Like when we wrote Duke’s, in his bar, there was always songs licensed and sourced playing in sourced music in the background. Shawn: Sometimes they do. And that’s gonna be a great question for them when you go see them, over there. Shawn: That’s, it’s fun that you’re going to meet those folks over there and that’s great. Aimee J.: Yeah, I’m very excited about that. Shawn: That was written into the show; they wanted that. Aimee J.: It was a beautiful version…. Shawn: It was beautiful, and they licensed it—they spent some money on it—and, you know, there is that to consider. I think there was a lot of bigger songs in the beginning. They’ll chase a big song if it feels appropriate and Michael will go and negotiate it and try and find something, but yeah, Shawn and Michael work creatively and collaborate together creatively to try and find the right material for each license. Aimee J.: ‘Cause it’s interesting how in a show there will be both. Aimee J.: As well as the original score you’ve done. Shawn: Yeah, that’s right. Yeah, a lot of times…well, nowadays it seems they do it a lot more separate. They used to do the prominent songs in the movie…. Shawn: …or in the show and then with a little bit of score scattered in there and then now it seems that….well again here we are talking about the technology and the information age again. We can release an album…. Aimee J.: Which we have, yeah. Aimee J.: Yeah it’s almost like “thank you technology for allowing us to have that”. Shawn: Yeah, and to have it quickly. Shawn: To make it happen fast. So, yeah, that’s fun. And with that soundtrack we’re gonna release another one. So that was Seasons 1 and 2. Aimee J.: 1 and 2. So is volume 2 a go? Shawn: Yeah. Volume 2 will release in September and then it will be Seasons 3 and 4. Aimee J.: That’s excellent. So you hear him first, there is going to be a volume 2. Shawn: Yes, there will be. Shawn: I think what’s been fun is that some of my favorite TV shows, especially during the time when Haven started, they also happened to be featuring music by some of my favorite TV composers. So, probably the most influential one was “Lost”. Shawn: I’d have to say it was “Lost”. And actually there was a concept at the beginning to maybe try and score Haven like “Lost”. Like, I say ‘to try and’ because Michael Giacchino is, in my opinion, the best working composer right now. And what he was doing on “Lost” with the chamber strings and that things…so awesome. Aimee J.: They were very unique. Shawn: And so unique. And they did a live recording session every week, and I thought: “well, maybe we could do something like that on Haven. And we could have this really unique sound.” And we tried a little bit of it and the closest I got to it would be the opening of the pilot, when the guy is running through the woods. Shawn: And it’s very, that’s very “Lost”esque. So I kind of went there and they all left it, no one really said anything about that queue, but whenever I tried to use that sound again: no one liked it. Shawn: …it’s everywhere now, right? Shawn: …because yeah, that’s a good question and, you know, so yeah the Sean Callery influence for theme—and for just being a great TV composer—is a good reference for sure. Aimee J.: Well definitely when you do anything, whether you’re writing or you’re making music for something, you’re gonna have influences. And “24” and “Lost” are pretty good influences to have. Shawn: Yeah. I mean for me, I don’t know if Shawn, uh, Shawn Pillar or Lloyd Segan or Scott Shepherd would agree with that from a show reference, but for me for a music reference, as sort of my heroes in television—working in television—what they were doing in the kind of music they were making was certainly an inspiration. Shawn: For me to try and go down that road and try and be inspired a little bit from what they do, you know. Aimee J.: …in what they were doing. Shawn: Absolutely. We all do. Aimee J.: Yeah, absolutely. So a question from “ElemenoFans”, Laura Mennall of course just joined Season 5. Shawn: Another good question. Motive is a police procedural that’s quite serious. Shawn: Right? And the, not that Haven doesn’t get serious, but it’s hard to now call Haven a police procedural. Aimee J.: We kind of went away from that. Shawn: …Motive, but in all three of my shows, there’s a blond cop—female cop—think about it: we have Audrey…. Shawn: …and Nathan with like the blond cop with the handsome dark-haired leading man. Shawn: Diane Kurger and Damian Bicher. Same thing. Female blond, female cop. Shawn: Right, Bridge. Motive is, this is crazy, what’s her name? I just watched the show last night. I, um…Angie, thank you, Angie and then, and um, her handsome leading man. So it’s three, my shows three female, blond cops. Aimee J.: You have a thing for it. Shawn: No, that would’ve been funny…No, she’s not. No, she’s not. But she’s a blond, leading lady and I certainly like blond leading ladies. Maybe that’s why I get the, uh, why I get on all these shows, but…Back to the music question, I just think that’s so funny with the, that they’re all like that…. Aimee J.: There’s a commonality. Shawn: …blond cops with the handsome, leading partners. That’s so funny. Aimee J.: So do you…and the fact that the main character is not the man—it’s the woman. Shawn: The woman, yeah. It’s great. Yeah, it’s great. Well Motive is, the whole concept of Motive, as we know, it’s you find out who the killer and the victim are at the beginning and then the rabble. So that in itself is an interesting concept, and it’s working and it’s doing really well, which is great. It’s an electronic score. It’s all, it’s synth based, with one sort of acoustic, natural element which is this nylon guitar thing that was in a demo that I did at the beginning of this Season, that one of the producers really liked—and liked that for Angie. So it’s an electronic score with a lot of electronic programming, a lot of pads and sounds and darkness, with the occasional nylon guitar ostinato rift that happens for Angie. It’s an electronic score, whereas I wouldn’t call Haven an electronic score. What we tried to do…well first of all, the main difference is: there’s not as much music in Motive as there is in Haven. It’s rare for a network show these days, like Motive, to not have 30 or 40 minutes of music. Haven maybe has, or sorry, Motive maybe has 20-25. Whereas Haven has about 38 minutes a score. Aimee J.: It’s usually throughout. Aimee J.: …and hear it. Shawn: That’s right. So that’s one of the big differences: is the amount of music. With Haven there’s still, even though occasionally it gets electronic, every once in a while for a trouble or for something unique we’ll go a little bit electronic, but it’s mostly “try and stay with acoustic guitars” electric guitar was brought it…the use of the electric guitar was brought in Season 2. We didn’t do anything in Season 1. Season 2 it came in because there was a push and a note from the network saying “we wanna make this a little bit more like a procedural cop show” and they’re specific was, you know, Nathan and Audrey turning over rocks and finding clues and stuff. So we thought we’ll just, let’s get a little electric guitar pace coming in, so that was kinda the first electric sounding instrument that came into it. Whereas before, you know, we had piano, had some bells, we’ve got some very weird recorded, uh, marine buoy kind of sounds. That sounded, tried to get things that sounded like the sea and sounded like water and that kind of thing. Aimee J.: Given where it is. 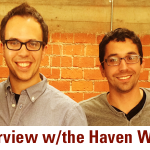 Shawn: Yeah, acoustic guitar, some nylon guitar, some strange pad sounds that were in there; and that was kind of the Haven palette. That’s the instrument palette. It’s grown since then, it’s gotten, you know, a little bit heavier, a little bit more electric; more electric guitar, heavier guitars, bigger drums. And now, right up to the end of Season 4, we started to get a little bit more into orchestral elements. So we’re starting to get a little grander, a little more strings. The biggest music that has ever been on Haven is in the last episode of Season 4. It’s mostly orchestral. Big strings and big drums and…it’s basically now just free-for-all. Aimee J.: …So far that we know of happening. Shawn: Like on Motive there’s no orchestral music whatsoever. It gets big and it gets emotional, but it gets big and emotional electronically…Synthesizer, synth programming. Aimee J.: It’s a different way. Shawn: You know, strange sounds building in a different kind of way, exactly. Whereas Haven requires more quote-on-quote music, more writing—more legitimate, actually writing of, you know, harmony and melody and arranging and….So that’s where, that’s where it went at the end of Season 4 and I know that probably mid-Season 5 we’ll be back there again. Aimee J.: ‘Cause it’s a supersize Season, it’s not been confirmed, so you never know. Aimee J.: We keep watching and the viewers are there. Shawn: If they keep getting the viewers…I mean, now we have an international audience that’s really into the show…. Aimee J.: Shawn does have a Twitter account. Aimee J.: I will be on the post, but he doesn’t really post, though. Aimee J.: He does have a website, though. Shawn: Yes, I do have a website that I keep updated, that I’m gonna update more. But I’m gonna get on Twitter, I’m gonna get on Instagram. Shawn: That’s my goal for next week, actually, to go on Instagram and start to get a little more public. Shawn: So I’m gonna get a little more public and give the fans some stuff, ‘cause I get lots of emails, too, from fans all the time and I know with your help, with your online prowess, you’ll be able to help me get connected with all these Haven fans and stuff so. Aimee J.: Yeah, absolutely. We’ll work on that together. Aimee J.: That’s not a problem. Aimee J.: So one of the things, speaking about the process and new Season and everything, that people are wondering is: How long does it take for you to do one episode and, given the fact that you do three shows, how do you juggle that kind of a schedule? Shawn: I’m glad you asked me that. What’s unique about my situation, with my other series, is they don’t run at the same time. Shawn: And that’s what I always have to make clear to my producers, my bosses, because they don’t want me…they want, they hire somebody, they want you on that show. Aimee J.: They want your attention. Shawn: Now, my situation is rare. A lot of composers especially who take on multiple projects, they’re working on them at the same time. Shawn: And I finished Motive, Motive went into the Bridge, the Bridge was finishing now and I went into Haven. Haven finishes and then I’m back on Motive. Motive finishes and I’m back on Bridge. It’s super rare, super unique and in there I’ll do the occasional movie-of-the-week or something like that or a documentary or something, but I like to just be on one. Aimee J.: Well does the supersize Season kind of impede that a little bit? Shawn: Well, what Shawn’s plan is: is to do 13 and then take a little break and then do the next 13. Shawn: ‘Cause they’re not gonna air all 26 in a row, I don’t think. Aimee J.: No, I don’t believe so. I think what they said was they’d air in the Fall and then at a later date. Shawn: At a later date. And maybe they’ll call it a Season 6, a 13 episode Season 6, I don’t know. Shawn: But I thought they were just gonna run all 26, and we’ll make, as you know, we’re making all 26. Shawn: But we’re gonna be mixing 13 at a time. Shawn: So I’ll get a little break after this 13 and then we’ll jump into the other 13. Shawn: ‘Cause Shawn Pillar is working so hard and like, and that whole crew out there, they need a break. Everyone needs a break. That’s a lot to do. Shawn: Yeah. And they’re also having a bit of a compressed shooting schedule this year, they’re shooting them in…see, I’m way out of my element talking now. You have to verify all this, but I think they’re shooting in six days, now, and they used to shoot in seven? I’m not sure. You’re whole crew that you’re gonna meet this afternoon will know all that information, but for me I usually work on a one—I got a little head start—I usually get a little head start for the first couple episodes. I have a couple weeks to do each one, which is the case right now, but when we get rolling it’s one a week. So I do, I have 7-9 days really to write the score, get it approved by Shawn, make any changes and then deliver it to Toronto to be mixed. Aimee J.: In one week? Shawn: Within one week. Yeah. Aimee J.: And do you, so while you’re working on one, does it happen that the next episode is kind of in queue waiting for you…. Shawn: Oh, yeah. Oh yeah, it’s waiting, yep. Shawn: Yeah, so we’ll spot that one while I’m writing one, and then that one’s just hanging over my head and you know, just you’re so into one and so much work and then the other one is, like you say, it’s in queue—it’s lined up ready for you to jump on right after. So you literally deliver one show and then jump right onto the next one. Shawn: And I know it’s gonna work and it’s great and we all like it: let’s use it! So it saves me a little bit of time, right? Aimee J.: …it works so well, is ‘cause it kind of has built a library for you, but also has kind of made an impression for fans. Shawn: No one actually knows what’s happening with this town—I don’t know what’s happening with the music either. That’s how I’m saying, that’s how I’m playing it. ‘Cause it was just this sort of hodge-podge and trying stuff and weird sounds; but throughout that, that was the process and that’s kinda what we ended up with. Aimee J.: That’s very Haven-like. Shawn: “…that’s gonna work for the show, if you have that box that you can work within and just kinda know what it is…” Because possibilities are literally limitless, you can try so many different things. Aimee J.: A number of different combinations. Shawn: So it’s finding something that works and I got really fortunate on Motive and on The Bridge where I was making a sound that they really responded to, that was different, very simple, not a lot of, you know, quote-on-quote melody and music being written. In Haven there was a lot of that at the beginning. There was a lot of pads and a lot of just percussion and not much melody—not much theme, except for like we’re saying the Lucy Ripley theme or the piano theme; and then trying to get back in more music as things got more emotional. Scott Shepherd, who is a wonderful creative talent, and I’m a huge fan and he’s just a wonderful guy and fantastic friend…He liked the weird, A-tonal, pad-like stuff that didn’t have much music in it. He loved that and he loved the guitar stuff. Where Shawn, Shawn’s a real romantic, he loves melody and harmony and he loves piano and he loves to hear themes and he loves to be moved by music and he’s not afraid of melody being right up there with dialog; and he’s always been like that. His dad was like that, too. On The Dead Zone and then on Wildfire there was a lot of themes and a lot of music being played. Aimee J.: That’s what the…. Shawn: So, Haven is both. It’s that A-tonal strangeness that Scott really championed and that made a very cool, unique sound; and then it’s this Shawn Pillar music approach which is melodic and beautiful and moving and not afraid to play a melody or have some chord changes and stuff like that. Aimee J.: …and you did that little video where the video was done. Aimee J.: …and you work on it, but it seems like you don’t see the full end product. So do you watch the end product when it airs or comes out on…? Shawn: I watch it when it airs…when I was saying that I go up to Toronto to watch them next, usually at the beginning…one at the beginning of the air, one at the end of the season. To see all the people that are working out there ‘cause we don’t, I don’t get to see these folks—we’re always on the phone with each other—in the mixing studio there, on the mixing stage where they combine sound effects, dialog and music. Shawn: That’s where you actually hear the final product. You hear the final product, you don’t see the final video, yet, usually we’re mixing—there’s still visual effects that are needing to be done—but, you know, on all my series what I do is: as soon as they’re done and they’re out, I buy them on iTunes immediately and I’ll watch them on—I own them—and I’ll watch them on iTunes or record them or tune in and watch them, but that’s truly when you see the final product. Shawn: It’s just there’s so much stuff after I’m done. I’m the last person really who works on the show in the, well I shouldn’t say in the post-capacity…like, you know, if we look at sound effects and dialog sound effects and music, music gets it last. I finish it; it’s kind of like the icing, so to speak in the audio portion. But the visual effects people and the color-timing people and the titling people, all of that, they get it after it’s done—just before it goes to air. So, there’s still that so we never really see the final, final. Aimee J.: ‘Til it’s actually on air. Shawn: Yeah. But I work to a locked picture, so the picture is not changing at all when I’m working on it, which is encouraging because that can be a bit of a challenge. But in television the norm is to work to a locked picture so at least I work to a picture that I know: that’s the episode. Aimee J.: That’s very helpful. Otherwise, can you imagine how many changes…. Shawn: …television you lock the show, you do the work, you mix it, then move on to the next one. Aimee J.: It’s ten of them—you pick which one works for you. Aimee J.: OK? Which you prefer, essentially. Alright, so don’t think too long. Aimee J.: Coke or Pepsi? Aimee J.: Summer or winter? Aimee J.: And the last one is: Action or comedy? Aimee J.: [chuckling] Well thank you so much for the taking the time, I appreciate that. Shawn: Oh, thank you, Aimee! Thank you for stopping in! Yeah, that’s great. I wish I was set up in my studio so you could see what’s going on there and you could see my Haven pictures and posters up and stuff. I was kinda hoping that we’d be in that environment, but…. Aimee J.: That’s ok, I can always come back. Shawn: Do that for Season 7. Aimee J.: There you go. Aimee J.: We’ll make it work. Aimee J.: Thank you very much. Aimee J.: And there you have it Haven fans, that was Shawn Pierce of Haven speaking with us about composing for the show that we love and so just a few notes to wrap it up…One: if you heard a noise in the background that was a dog barking, that was Shawn’s dog Flo, who was there. And also if you heard mention of Kathleen, that is not a new character coming to Haven, that is Shawn’s fiancé. So just to be clear there are no new characters coming to Haven or Motive or Bridge. He was just mentioning his fiancé. Also, let me take this time to apologize to Mags, her Twitter name is pronounced “Hoot and Beaut” apologies, I’m gonna mess that up in the next interview as well, so I’m just gonna go ahead and apologize for that now. So until next time, Haven fans, this is Aimee J. saying “peace”.